Ultralab continues to work in both health and school design projects, including a key role in Stepping Stones School, a school for young people with Hemiplegia. Our research into the design of learning spaces extends almost a decade. More recently, we produced a research report titled 'Building Learning Futures' which not only gave some indication of where we are going wrong with our current school buildings, but what the drivers for change will be, coupled with some recommendations. We also built some scenarios looking at what the possibilities are for the future school. This report was produced in conjunction with CABE, the Commission for Architecture and the Built Environment. 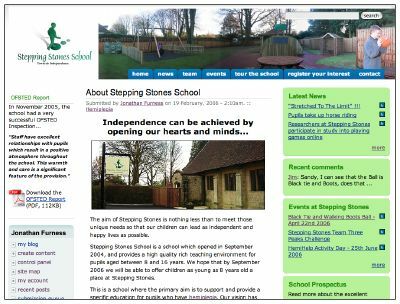 In 2004 and 2005, Ultralab worked closely with Stepping Stones, a school for children with Hemiplegia, to create a delightful and engaging learning environment. Our expertise ranged from developing a vision for learning, basing our ideas on a distributed model of learning. The school website now features a virtual tour around the school.